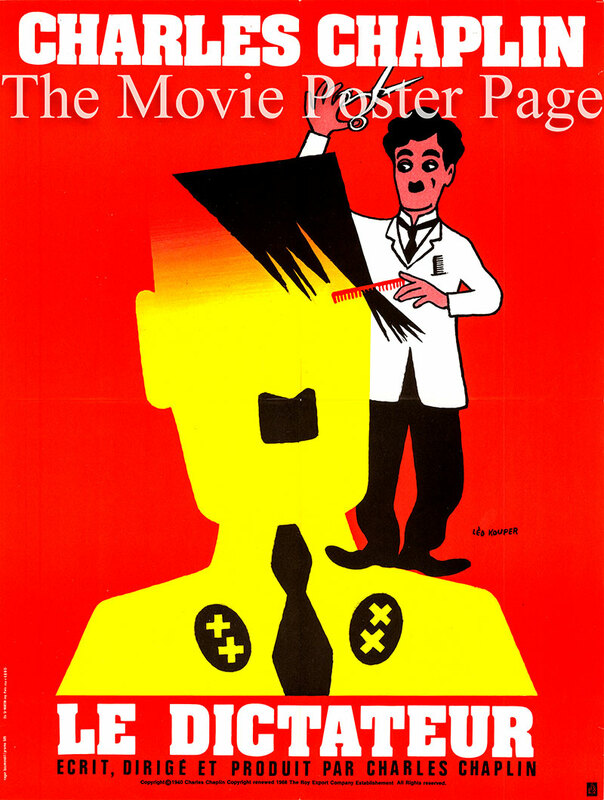 This is a 22.5" x 30.5" French poster designed by Leo Kouper for a 1968 rerelease of the 1940 film The Great Dictator written and directed by Charles Chaplin and starring Charlie Chaplin as the dictator Adenoid Hynkel/the Jewish barber. Plot summary: Twenty years after the end of World War I Adenoid Hynkel has become dictator of the nation of Tomania. Hynkel wants to exterminate the Jews, establish a pure Aryan state and dominate the world. A Jewish barber is unaware of any of this because of war injuries, which have left him with amnesia. His old war comrade Commander Schultz [Reginald Gardiner] saves him from the persecution the other Jews are experiencing in the ghetto. The barber meets a Jewish washerwoman named Hannah, [Paulette Goddard] with whom he begins a relationship.